Mielle Organics is it for me. I purchased this entire bundle over Thanksgiving Weekend during the Black Friday sale. I've always wanted to try this product and I'm proud of myself for making this purchase! I have a few DIYs I want to keep in my staple stash: African Black Soap, Green Tea Rinse, Henna Gloss, Rice Water Rinse, Fengreek mist, Mango And Raw Cocoa Butter Creme and Flaxseed Hair Gel. I will definitely keep up with massaging my scalp at least 4 times a week with castor oil, which is my favorite oil to use. Hair challenges keep me on track to succeeding my goals, while learn ingmore about my hair in order to keep her healthy. I have found that I can retain 1.5-2 inches of growth every 3 months. My normal rate is 1 inch every 3 months. I'm going to do my best to retain the length grown as I keep up with my hair challenges. Healthy Hair Challenge | Summer No Comb Challenge 2016 1 inch in 3 months! Healthy Hair Challenge | Fall Back To The Basics Challenge 2016 1 inch in 3 months! I'm really striving to make it to MBL/WL by the end of 2018. As Black Hair Information always puts it, "With Health Comes Length." As long as I keep my hair healthy then I can definitely achieve this Yearly Goal! I definitely want to go all in this year especially with protective styles. So I'm thinking more with crochet braids and styles that have less tension on my own hair. I'm thinking: straight hair sew-in weave, Marley twists, Jamaican bounce crochet braids, and wavy crochet braids. I would love to hang out with other naturalistas in Indy. There is actually a natural hair meet up group in Indy called the Naturalistas in Nap, where they have seminars, watch movies, have conventions, and just hang out as natural sistas. I think I would have lots of fun with them and benefit from the encouragement and support these sistas would give. Naptural85 YouTube channel is great for learning simple and more intricate hair styles, DIY recipes, and learn how to care for your own hair. 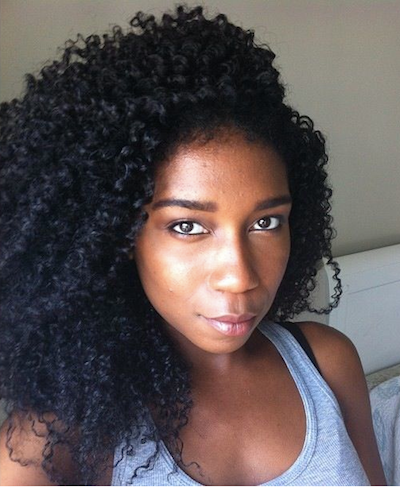 She gives great tips on how to keep moisture, ways to style a dud, and to achieve length retention. I havent done much on my blog since last July 2017, but I still want to evolve my website. I want to do a lot more updates, promoting, and professional pictures. And just keep up with it in general. This is very important in any healthy hair journey. My hair is a crown of glory that God has blessed me with, so I have nothing but love for my hair. I do get frustrated and overwhelmed with my hair, but I wish of nothing else on my scalp. I thank God everyday for my hair and I am very thankful for the journey I have had and the journey I will embark on this year with my hair. Natural hair says: if you know the mistakes you faced with your hair, you will be able to plan for goals and inspirations for the next year. Plan for goals for your hair and see how far you can go. Write them down in a notebook, on your phone, in a calendar book, or on your forehead, but have a plan. Good luck this year!